Are We Witnessing the Shale Revolution 2.0? As roughly 3,000 energy professionals and world leaders wrap up the annual CERAWeek conference in Houston this week, it is abundantly clear why the E&E News reported Monday there is a “wave of optimism” at the gathering. That’s because evidence continues to mount that the U.S. oil and natural as industry is not only recovering from the commodity price collapse of 2015 and 2016 — we could very well be witnessing the beginning of the Shale Revolution Version 2.0. Alaska Sen. Dan Sullivan said on Monday that America is “on the cusp of a major energy renaissance,” and it’s tough to argue with that assessment, based on the following evidence. CNN reported on Thursday that “the American oil industry may be on the cusp of an incredible revival” after the U.S. Energy Information Administration (EIA) upwardly revised its oil production outlook, saying it expects domestic oil output to increase to an average of 9.2 million barrels per day (mbpd) this year and then rise to 9.7 mbpd in 2018. EIA even projects oil production will surpass the 10 million barrels per day threshold late in the year, as its following graphic shows. This projected 2018 production would break the annual production record of 9.67 mbpd set back in 1970 and continue the remarkable upward trajectory that started in the late 2000s. U.S. oil production has climbed roughly 125,000 bpd on average each month since September of 2016, pushing total U.S. production back above the 9 mbpd threshold in February. As Bloomberg recently noted, that is 34 percent faster than the original shale boom of 2011-2014, when the monthly growth rate was 93,000 bpd, as the following Bloomberg graphic illustrates. The national oil rig count has also increased seven straight weeks to more than 600 nationwide — the highest level since October 2015, which was right before commodity prices crashed. And remarkably, EIA and the International Energy Agency (IEA) agree the rapid oil production growth trend may just be getting started in the U.S.
IEA reported Monday at the CERAWeek conference that global oil demand isn’t likely to peak any time soon and that the U.S. will likely lead the charge to fill the supply void, increasing production anywhere from 1.4 million to three million barrels per day (bpd) compared to its current level of production by 2022, depending on oil prices. IEA estimates that worldwide upstream investment is currently about 25 percent below what is needed to be to meet demand growth. But in sharp contrast, U.S. drillers plan to increase their spending by 25 percent in 2017, and the U.S. industry is off to best start investment-wise since 1999, according to Bloomberg. In other words — the U.S. is the only major oil producing country positioned to even entertain the notion of meeting this expected demand. And as the following Bloomberg graphic illustrates, experts are subsequently projecting U.S. shale oil production to increase anywhere from 400,000 to 900,000 bpd from its current level of roughly five million bpd. These projections and the recent 125,000 bpd growth rate per month considered, it appears quite possible that the U.S. could be on a path toward surpassing the record 9.6 bpd production set in 1970 some time this year, rather than in 2018. The reason this is happening is clear: Out of necessity, the U.S. shale industry became far more innovative and efficient during the dark days of the 2015 and 2016 OPEC price war, and has emerged stronger than ever since the recent OPEC output cuts/capitulation this past November. As Tamar Essner, energy director of Nasdaq Advisory Services, noted this week “any dollar invested today is double as efficient as it was two years ago” due to shale’s improved efficiency. Investors.com reported this week that new rigs have slashed the time it takes to drill a new well and move onto another to seven to 10 days rather than three to four weeks. Bloomberg reported recently that Shell has slashed its well completion costs 56 percent since 2013 and can now complete a well for $5.5 million. Break-even prices are even lower in the Permian Basin, at $32-$38 per barrel, which is all-the-more significant considering EIA last month projected that 70,000 bpd of its revised 80,000 bpd projected production increase for March would come from the Permian. The average Permian well now averages 668 barrels per day, compared to just 98 barrels four years ago — just one reason the term “Permania” has been thrown around liberally at the CERAWeek conference. The current Permian boom has prompted Pioneer Natural Resources founder and “King of the Permian” Scott Sheffield to recently say, “People just don’t seem to realize how big the Permian is. It will eventually pass the Ghawar field in Saudi Arabia, and that is the biggest in the world.” Sheffield even went so far as to predict the Permian could produce 8-10 mbd alone by 2027. It currently produces 2.3 mbd. It is no wonder that U.S. crude stockpiles are at their highest levels since 1982 and we are also now exporting a record of almost 900,000 bpd. 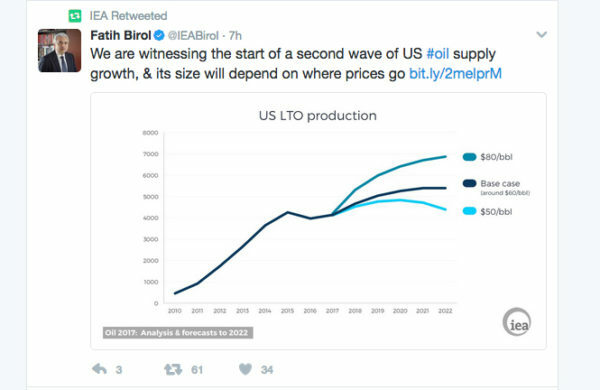 And it’s also apparent that the Post Carbon Institute’s Richard Heinberg’s January claim that “… the glory days of U.S. tight oil are in the past” couldn’t be further from the truth. 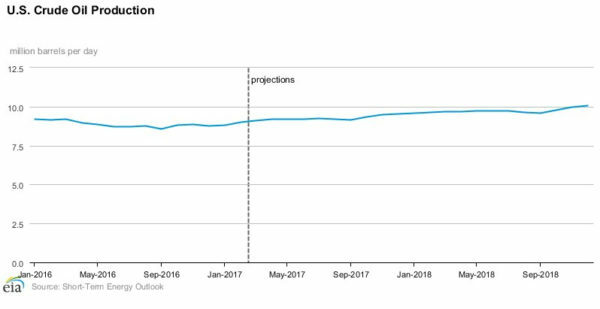 Not to be overlooked is the fact that EIA and IEA both remain bullish on their U.S. natural gas production outlooks as well. EIA forecasts U.S. dry natural gas production to increase to 73.7 billion cubic feet per day (bcf/d) this year and 77.8 bcf/d in 2018. These 1.4 and 5.5 bcf/d increases from 2016 levels, respectively, would put U.S. on track to approach the record levels of production seen in 2015. EIA projects this reverse of last year’s production decline — the first since 2005 — will be driven by the fact that Henry Hub natural gas spot prices are expected to average $3.03/MMBtu in 2017 and $3.45/MMBtu in 2018. The IEA reported this week that it may have to increase forecast “significantly” — especially if President Donald Trump’s plan to hasten pipeline development proves successful. Birol said Tuesday that U.S. natural gas production could grow from an expected 600 billion cubic meters (1,968 billion cubic feet) in the next 20 years, by another 200 billion cubic meters (656 bcf) above that. Shale gas growth is expected to continue being driven by the Marcellus and Utica shales. Throw in the fact that it was announced this week that the oil and gas industry is spearheading the strongest U.S. jobs growth in 18 months — and the fact that ExxonMobil this week announced $20 billion in Gulf Coast investment projects that could add another 45,000 jobs — and it’s clear why the mood at CERAWeek has been far more upbeat this year than a year ago.